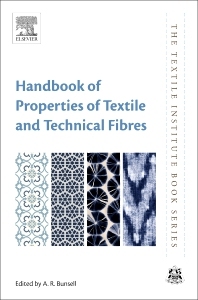 Handbook of Properties of Textile and Technical Fibres, Second Edition introduces tensile properties and failure and testing of fibers, also examining tensile properties and the failure of natural fibers, such as cotton, hemp, flax, agave, wool and silk. Next, the book discusses the tensile properties and failure of synthetic fibers, ranging from polyamide, polyester, polyethylene and carbon fibers. Chapters provide a general background of the fiber, including its manufacture, microstructure, factors that affect tensile properties and methods to improve tensile failure. With its distinguished editor and international contributors, this book is an important reference for fiber scientists, textile technologists, engineers and academics. Dr Anthony Bunsell is Research Professor responsible for studies in the fields of fibre reinforcements and fibre composites at the Materials Centre of the Ecole des Mines de Paris. He is also Professor at the University of Nebraska Lincoln. He has authored more than 250 papers in international scientific journals and has produced fifteen books on materials science, composites and fibres. He has received a number of rewards for his research and was the first person to be made life Fellow of the French Association for Composite Materials (AMAC) and is only one of very few recipients of the title World Fellow of the International Committee on Composite Materials.